May 16th, 2018 — President Donald Trump opened US Embassy in Jerusalem. July 19th – official declaration made that Israel is the Nation State of the Jewish People (their Constitution is Torah / Yeshua is the Living Torah). “REEDUCATE THE NATIONS ABOUT THE GOSPEL MADE IN ZION AND THE IMPORTANCE OF STANDING WITH ISRAEL AGAINST ALL ODDS”. Continue bathing our efforts in prayer as we move forward. Our Embassy in Mevasaret Zion (west of Jerusalem) is a strategic base of operations – a place where members from all the nations can gather to bless Israel & be refreshed in His Presence. Since September 28, 2018 our majestic Embassy has been officially open and has received guests from many nations already. Most recently a group of 25 from Portugal (many Sephardic!) came with Pastora Carla Melo – she was the one who translated Archbishop’s books into Portuguese. May many more from the nations visit soon! I have come to the end of my stay at the Embassy as a volunteer and wanted to say ‘Thank You’ from the bottom of my heart for this experience. Our Embassy is a beautiful place. The Spirit of Yah flows here, enveloping you in the purest love of Yah. Through difficult times and good times, the joy of the Lord keeps a song on your lips and a jig in your step. The physical work at the embassy has been light since I have been here, so that has left more time for heavenly work. We who work at the Embassy must first truly love Israel and her wonderful people. If you do this, you can’t help but plant seeds as you go out among the people of Israel. At the Embassy we have praise and worship each evening to fill our souls with seed — so we can go out and plant as soon as the opportunity rises. The harvest is ripe here, even among the Orthodox Jews, and the Spirit will lead those who are ready to hear the Word to you. You just have to be obedient to the Spirit and He will bring the harvest. Some needs we have at the Embassy — as always prayer! Our Embassy building is older and during my stay here we have received a large amount of rain. Praise Yah, this really helps with the drought; however, this also created issues –many of the homes around us have also had to reseal roofs and fix leaks in their homes. The second issue to consider is regarding the flags of the nations. We should really come up with a plan on how to keep our flags in tip-top condition, perhaps by replacing each flag on a yearly basis. The weather here has faded and torn almost all the flags. I know I want my American flag in its absolute best condition, so when I return home, I am going to buy 2 USA flags to have on hand at the Embassy so they can be changed out as often as needed. Also, a great big “Thank You” to a wonderful new friend named Raijaliisa, our embassy manager. What a joy it has been having her alongside me! She has guided me in so many ways, from house cleaning her way to guiding me downtown to Jerusalem for sightseeing and shopping. I cherish her friendship and she has kept me laughing the whole time. We are blessed to have her as a house mother! And I truly Thank YAH, for His blessings! This has been a dream come true in every sense for my life. May you all have the privilege to come and serve our Father in His Embassy for His Glory and for His returning Kingdom. CyRilla Schultz (left) with Raijaliisa Ovadia in the Embassy kitchen area. Special thanks to all our volunteers, including Pastor Hanne Hansen (Delegate for Norway) who also assisted our Embassy Manager this year – and upcoming helper Erja Lastunen, Vice Delegate for Finland. Prayerfully consider if Yah is calling YOU to serve in The Land as a volunteer – contact us at embassy@unitednationsforisrael.com for more information. Additional if you have not yet been included as one of the 70 Righteous of the Nations (committing to faithfully give at least $100 per month), please consider joining us. What an honor it is to undergird our Embassy operations in this way, having a direct impact on maintaining this vital property to which all nations gather for prayer and to be refreshed. Such a difference we have already made in Yerushalayim — may we all see the salvation of Israel in our day! 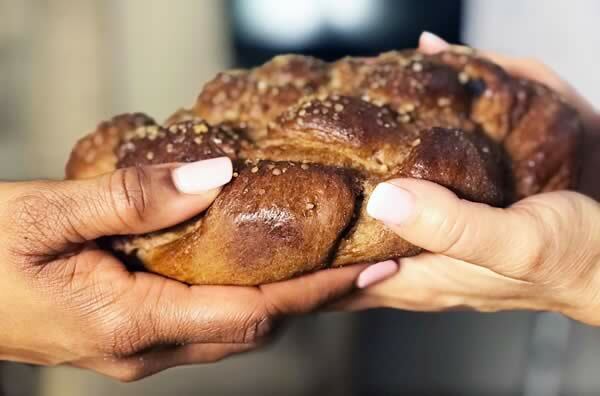 A PERSONAL NOTE: I love how Pastor CyRilla often says, “Israelis are so hungry for acceptance” – may all of our UNIFY efforts truly satisfy that need! And, speaking of being hungry . . . Various nations have shared their photos & testimonies below about how the news of our UNIFY mission is spreading. Let the Ruach HaKodesh stir you as you read – then pray, asking how He may use you, right where you live. It may be time for all of us to “get out of the boat” (our comfort zone) and walk on water! Simple ways to share with others include distributing UNIFY business cards, pens and flyers, as well as Archbishop’s books and video teachings. Be prepared to plant seeds wherever you go and water them with loving prayer. Don’t forget to also share with people we meet about our personal Sukkot Tour experiences, spreading a hunger to visit His Promised Land. Insightful weekend in St Augustine! Archbishop and Rabbi spent a great weekend together with Yochanan Marcellino, Archbishop’s literary agent for her historic novel about the Sephardic Conversos during the Spanish Inquisition. He and his lovely wife Hannah came from Nashville to St Augustine to get to know each other better and to strategize forward! All of your prayers were felt and the weekend was a total success. See our Live interview with Yochanan and rejoice with us! Keep up those prayers as we UNITE for the restoration of all of Israel, including the ANUSIM and Sephardic Jews. The Historic Novel will be published soon — we are believing for a motion picture and a Broadway show to follow the book. Pray for Yochanan to have favor, favor, favor with our book! Believers from 5 states and various backgrounds gathered in historic St. Augustine, FL, the oldest city in America and an open US gateway, to seek God for guidance. We are all US citizens and members of the United Nations for Israel. We’ve prayed for revelation from God to help turn America back to Him and make it a true Sheep Nation fulfilling its Biblical purpose. His strategy is a 50-State Reconciliation Tour. We came together this weekend to receive instructions from God for moving forward, and we received so much more: He really moved! God confirmed each of our roles in this movement through Archbishop Dominiquae Bierman. We spent hours in prayer sessions at which the Lord confirmed His heart for the USA and Israel, while activating us to be useful in His plan. We’re praying that God will bring the church in America back to the truth of the whole Bible and the Hebrew roots of the Christian faith, while healing the soul of this nation! (2 Chron. 7:14) This moment was a turning point for all of us during this gathering, especially me. God is calling us to the next level! Entering into covenant with Israel is essential to America fulfilling her destiny. We also spent time in a historic area of St. Augustine honoring all those who were a part of the Civil Rights Movement in St. Augustine and acknowledging the history of slavery there. Being in this area was truly significant because we gathered to pray into God’s strategy for the 50-State Reconciliation Tour, to heal divisions in the USA and unite our nation. After the play, we had a powerful time of discourse, deliverance, reconciliation, healing and intercession. We will continue to gather as a group and allow God to connect us with others who are interested in healing and uniting our nation. State by state, we will impart the anointing for healing and reconciliation we received this weekend into groups all over America, as we come together to turn this nation back to God and prepare for Messiah’s return. The windows of heaven were truly open over us, as YHVH prepares to ‘drain the swamp’ into which His Bride has fallen in these last days. It was previously revealed to me that this was “D-Day” for our Kad-Esh MAP Ministries Team, assembled to focus upon the UNIFY Awake USA mission. The timing of this Retreat (and its strategic location at this gateway to America) would be a turning point in the war we are fighting today with replacement theology and all of its terrible results. Our Team realizes the mission ahead of us requires exactly the same unity of heart and soul as the Allied Forces exhibited. We must be standing Shoulder-to-Shoulder as one, demonstrated to us by our Commander-in-Chief, Yeshua, as He was ECHAD with The Father. “Iron sharpened iron” for this entire Retreat, which included heartfelt input from everyone gathered there. Yah orchestrated each of our steps and uttered His words through us with Apostolic and Prophetic power. We are ALL being put into position to build His Kingdom in America, using Pastor CyRilla Schultz (National Delegate) and Apostle Markita Brooks (Vice Delegate) to keep order. The focus of Psalms 119 (His Torah outlined from Aleph to Tav) was astounding. Twenty- two Hebrew letters form the foundation of the language: He gathered twenty-two Team members and firmly established the UNIFY Awake USA foundation. (And we know there are many more “vessels of fire” in America than the 22 He gathered – Praise Yah!) We are ready to build His house & to see a true Godly Awakening bear fruit — without replacement theology to thwart His plans for this Sheep Nation to come forth. Each of us gained a deeper understanding of His great love for America, despite our falling for cheap grace. He is truly giving us “one more time”, as the Samson Prophecy of 2009 foretold (see also Hebrews 12:26,27). And, yes, it will be costly as we are shaken, so that only what is firmly upon His holy foundation will remain. We must become those “living sacrifices, holy and acceptable to Him” (Romans 12:1), just as Yeshua was for us, so that all the world will see Him in our generation. In summary, our time of gathering was a foretaste of His consuming fire — preparing us all, in all the nations, for the days ahead. We here in this land may walk through a fire and through a flood until America is truly awakened. But He will walk with us — as is stated in Hebrews 12; however, we must be willing to humbly endure His chastening, knowing we are His beloved sons and daughters through which He wants to show forth His glory. This is so our nations can go through His wrath and receive favor in the midst of this judgment. It is so that multitudes of souls may be gathered into His Kingdom – that is His greatest desire. We will march together UNIFY-ed and joyful in this final hour. May we all say with one voice, “Shema” America – this is your finest hour! More exciting reports from the Nations in the next week Shabbat Letter, UNIFY Report, Part 2!